Most of us would agree that speeding in a car on public streets is not a good thing. But what if there is a medical emergency and someone needs to break the speed limit in order save a life? While both a joy-rider in a stolen car and someone rushing to a hospital are placing themselves and others at risk by speeding we are more likely to forgive the transgression of the latter. It's all about the context. Let's take a look at some of the causes of dog biting and dog nipping. Just as the causes are different, what to do about them are different as well. 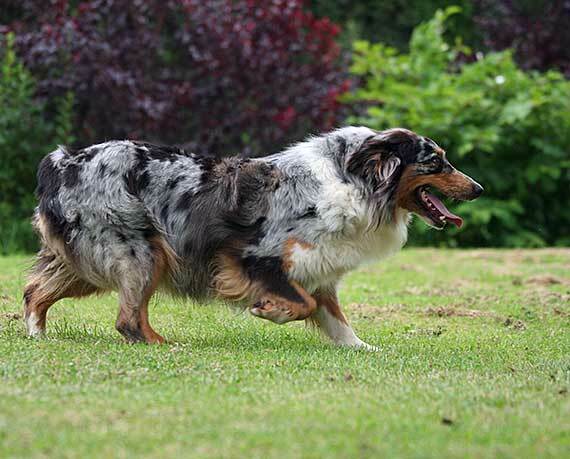 Of particular interest with the Australian Shepherd is their innate herding drive which causes them to nip, especially at moving targets like running children. What Causes Dog Biting And Nipping? Dogs can get aggressive and lash out resulting in a bite. However, there are several types of aggressive bites that can be caused by very different things. Aggression is not just the result of your dog being angry. It can also be caused by things like fear, frustration, or guarding behavior. Learn the signs to watch for that your dog's herding instinct is about to lead to nipping and biting. 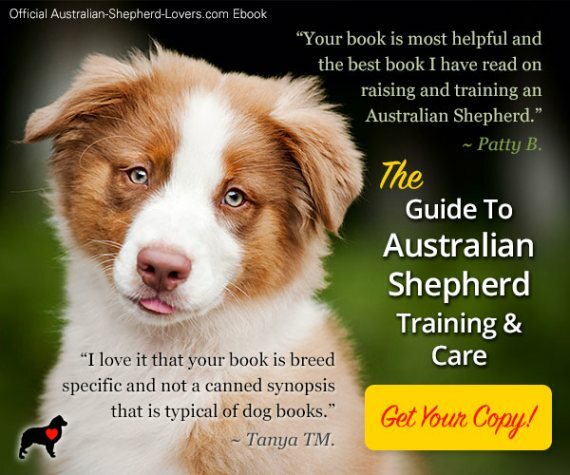 It's important to differentiate those types of dog bites from those that may occur as a result of the herding instinct of breeds like the Australian Shepherd. While Aussies bred for pets or for conformation may not have as strong a herding drive, those that are bred to be working dogs will have it in spades. This will often be triggered by children (or adults) or other dogs running around. My wife and I used this drive to help exercise our Aussie, Levi. We would start in the middle of the park with all three of us together. My wife would start to run away from me and Levi. Of course, he couldn't resist and would start to chase her. Invariably, as he caught up he would start to nip at her legs and ankles. But before he could get too carried away she would stop running. Meanwhile, I would call him and start running in the opposite direction. We would go back and forth like this at greater and greater distances until he was running the full length of the park. This is not the thing to do if you want to extinguish herding and nipping behavior. Luckily we usually had the park to ourselves and we didn't have children so we weren't too concerned about it. It was just a great way for us all to have fun and get a bit of exercise. 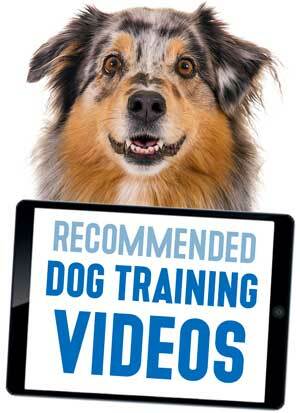 What If You Actually Want To Stop Your Dog From Nipping And Herding? First, let's address your reaction to being nipped. You may have heard of the technique where you yelp or say "Ow!" in a high pitch to shock your dog and mimic the response a puppy might give when one of it's littermates bites them. This may work with puppies but with older dogs it could be part of the problem. The older a dog gets the more those sounds will encourage biting as they now sound more like the noises that prey would make. So yelping and pulling away could trigger your dog just the way that those sounds and movement from a rabbit would. Instead, stop moving and don't make sounds when the nipping starts. 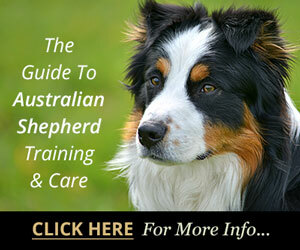 This technique will work for any dog breed, however, those of us with herding breeds will have a bit more work to do. 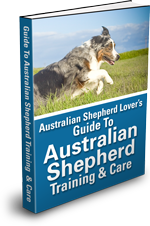 While Australian Shepherds are born with herding instinct it doesn't generally emerge or become a problem until the dog is several months old. From six months to a year is when you'll likely see real problems develop if they are not addressed. Like any training, it will require repetition and patience but it will be worth it in the long run. Start by just watching your dog. What tends to start them herding? People running or riding bikes nearby? Perhaps it's other dogs or animals that get them going. What signs do they give that they are about to start herding behavior? Do they drop their head, crouch or stare at the target? Once you have an idea of the triggers and signs you can begin to deal with it in a controlled environment. Put a leash on them with a long lead with plenty of slack. Have someone engage in the behavior that usually triggers a herding response (like running by). To begin with it's best to have the person be an adult and later perhaps an older child (not small children) for safety reasons. 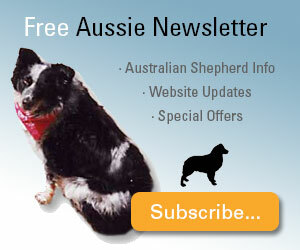 Now watch your dog for signs that they are going to start herding behavior. If he comes to you right away—great! If not say "no" and use the leash to give gentle correction if he still ignores you. The key word is "gentle." You are just trying to redirect his attention toward you, not land a Marlin. In order to have the training stick, commit to about 20 minutes per day until your dog is reliably able to focus on you and not give in to their herding instinct. But What About Stopping My Dog Biting And Nipping At Ankles? While the training described above is well and good, what can you do about an Aussie that is continually nipping at ankles? It's annoying and can be dangerous as they will even do it when you are going down the stairs which can result in a fall. Not to mention damage to clothing or the potential of breaking the skin. It's bad enough when it happens to you, but what about guests to your home or children? It can be much more than an annoyance. Others will not differentiate a relatively minor nip that breaks the skin from a dog bite and neither will the authorities. Should you break out the water bottles, air cans, and shock collars? No. While those methods may work to stop the behavior you could also damage the relationship you have with your dog. Try to always use reward to encourage good behavior before using punishment to dissuade bad behavior. 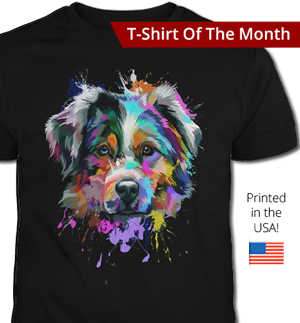 Aussies are very loyal and willing to please, so if using the reward approach isn't working you might want to consult with a professional dog trainer before resorting to punishment on your own. Using rewards should work. If they are not you may be inadvertently rewarding the bad behavior. For example, if you don't wait long enough for them to calm down and give a treat while they are still trying to nip your ankles you can't blame your dog for doing more of the same. Remember to be patient. You have decided to become the owner of a herding breed dog which has been bred for generations to do what you now expect it to stop doing. We've looked at considering the context of the dog bite or dog nipping. 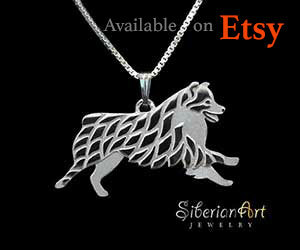 Is it caused by the herding instinct or is it something else like aggression? If it is due to the herding drive running away from the dog and yelling is not going to work and will likely make things worse. We've covered some of the approaches that will help you be more successful when dealing with this problem using rewards as a motivator rather than punishment. It may be difficult, especially at first, but don't allow your frustration to show. Keep your training sessions fun and positive realizing that it will take time and there will be setbacks. In the end it will be well worth it as your Aussie develops into a well behaved dog that you can feel comfortable having other people and animals around whether in your home or out in public.